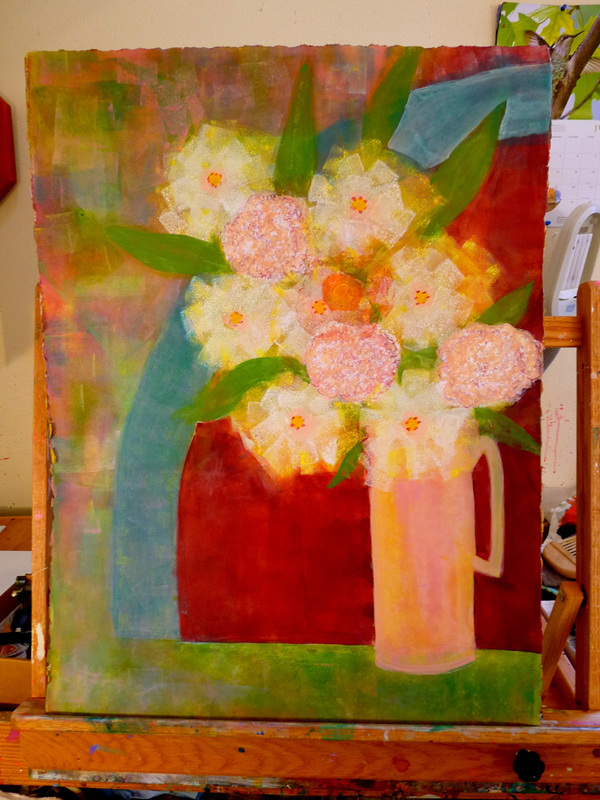 In my studio I am working on a private commission for a Tahoe residence. 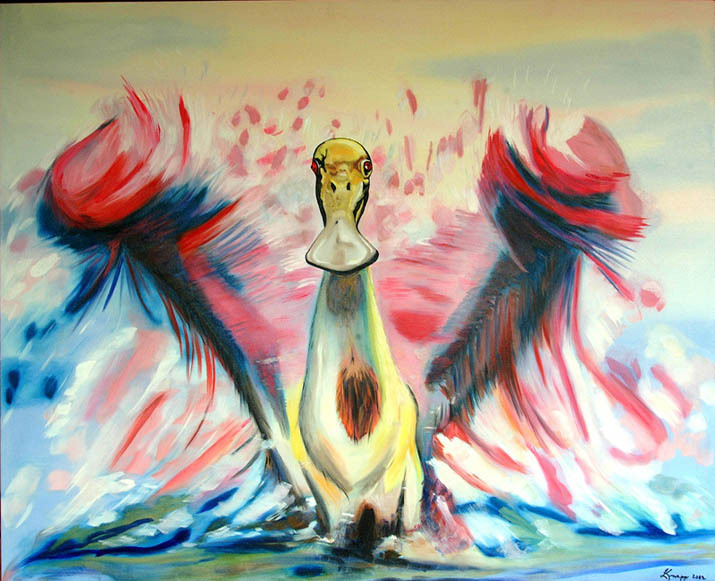 The piece is an oil on canvas, fairly large at 35″ x 52″. The client was looking for something that was reminiscent of the trees in that area and Fall colors. This is a work in progress. 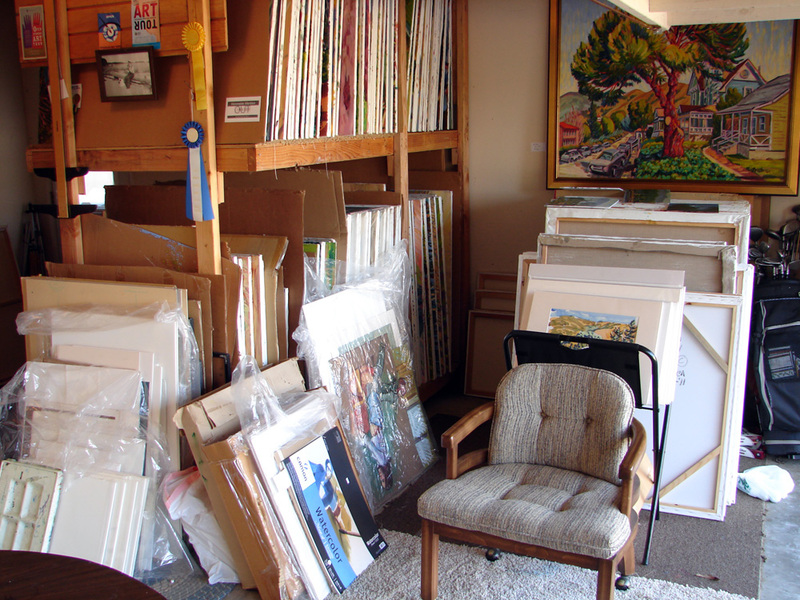 The handicap accessible working studio in Arroyo Grande will be open the first weekend of the Open Studios Art Tour. 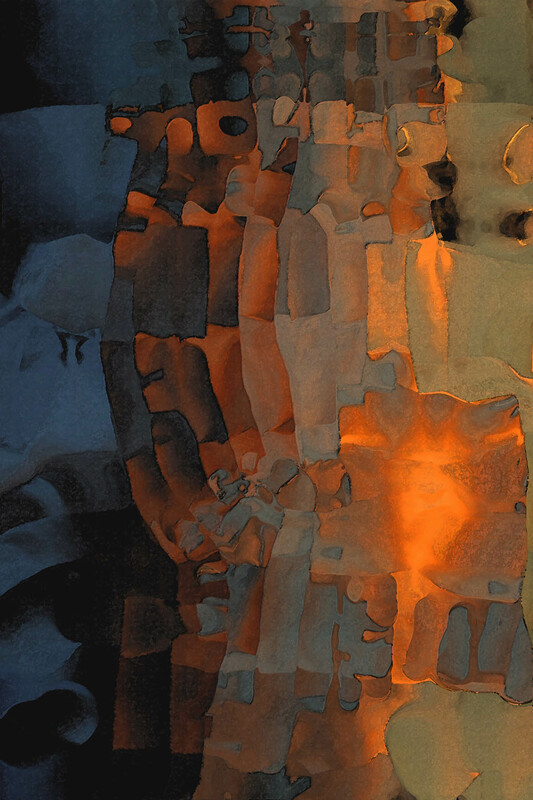 To view more work by Carol, check out her website. 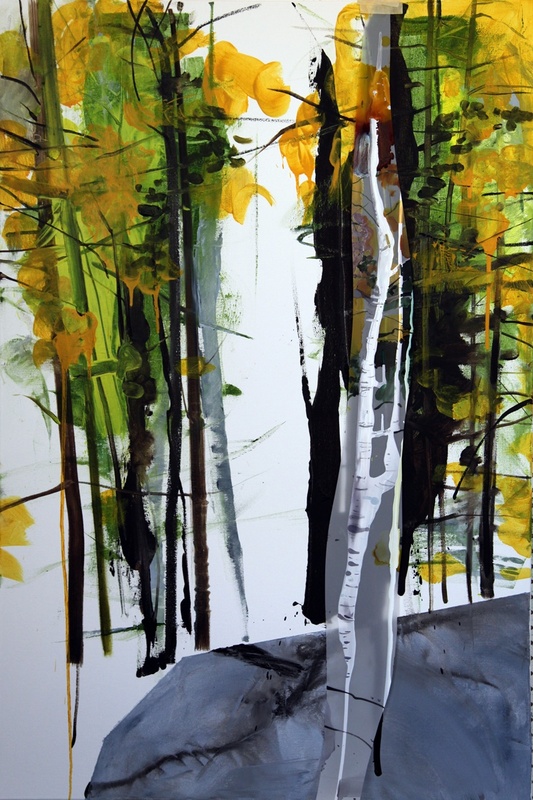 Her focus is on abstract landscape based oil paintings. Every year the Open Studios Art Tour falls closely on the heels of the Plein Air Festival, another regular event on my calendar which makes October a very hectic and pressure-filled month for me. Perhaps with both events so close together, I am distracted so as not to place too much emphasis on either one. After about ten years of doing both, I do have my routines so the process becomes easier. First, its paint, then clean up and present. And most important of all, do I have enough frames? 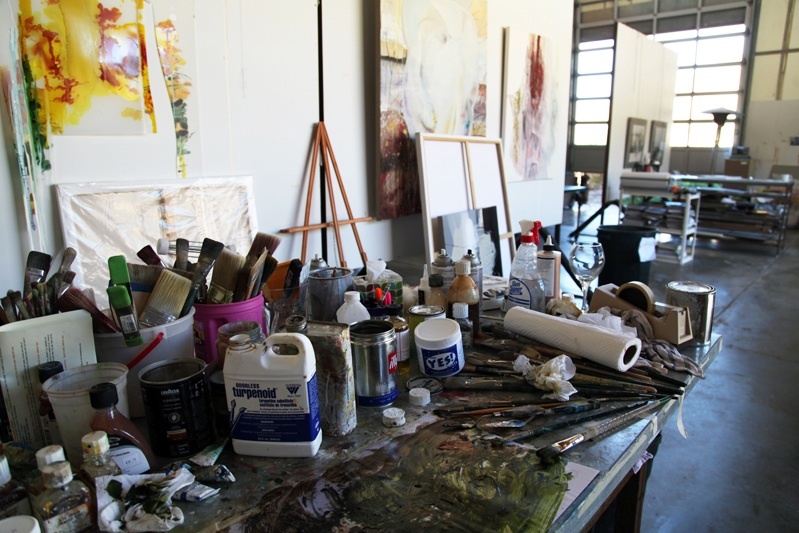 I have no shortage of work as you may tell from photos of my studio, but the problem is how to present so many paintings in so many different techniques and subjects without overwhelming and ultimately confusing my visitors? 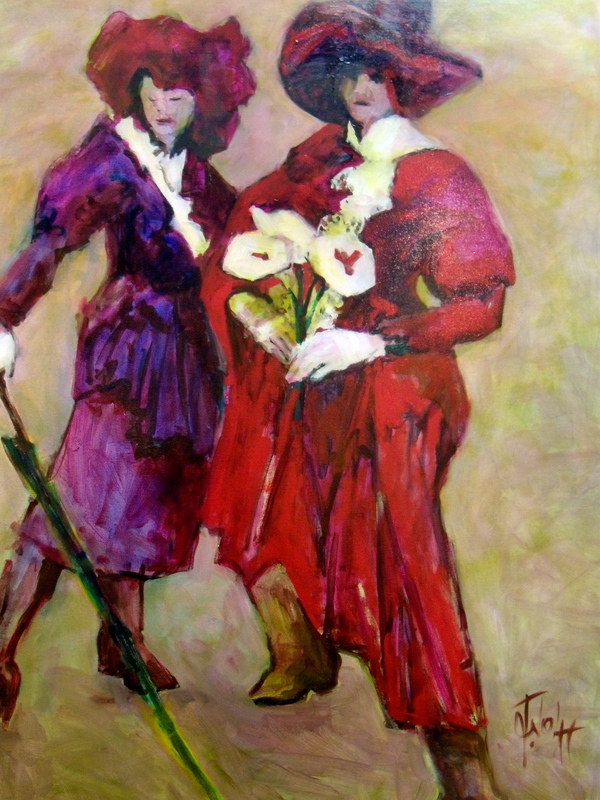 The Open Studios Art Tour is the perfect time to pull out wonderful work that may never have been in an exhibit or show a technique I am proud of, but rarely seen. And yet, there is not enough wall space! Some people like the haphazard mess of canvases stacked against the wall. This gives visitors the thrill of discovery: hunting for something that others have overlooked. What about prices? It’s not possible to price everything and have stickers and price tags everywhere. 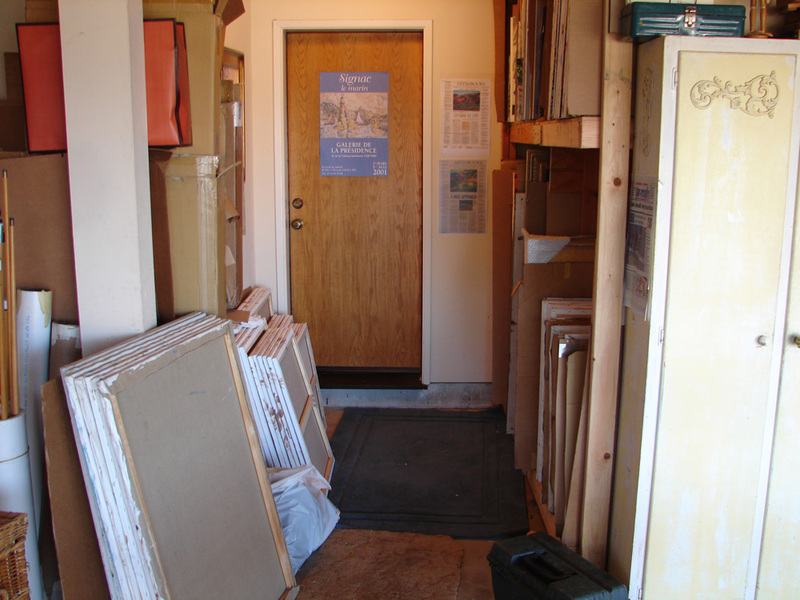 I try to have prices on the framed pieces hanging on the walls that match my gallery prices but all of those paintings packed into storage racks, well, they have to find a home too. Just recently my collection has grown even more. I took a trip back to my home state of Michigan where I still had a few hundred paintings in storage from when I moved here about twelve years ago. I was thrilled to see some old friends, paintings of Michigan, California and Europe, redolent with memories of all the places I’ve painted and experiences had while painting. Being a plein air painter, every work keys the time and place where I executed the piece, the weather that day, the people I met, and what I was going through in my life at that time. Plus, I brought back about five large portfolios of watercolors. I began my professional career exclusively as a watercolorist. After about five years I gradually shifted into oils, but I still paint both and love both techniques. The portfolios are jammed and I have many wonderful full-sheet watercolors, especially from the winter I spent in San Sebastian, Spain in 1996. So many memories, but now is the time to turn them into gold (in order to buy more frames) and keep on painting. I hope I have a large turnout at my studio as the first step as an artist is to get the people to take a look. 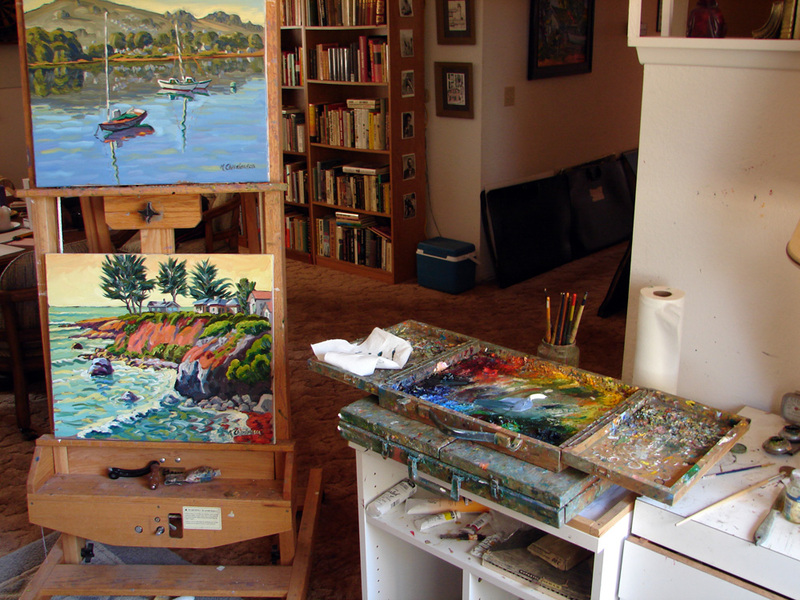 You can stop by and visit Ken’s Los Osos studio both weekends of Open Studios Art Tour. 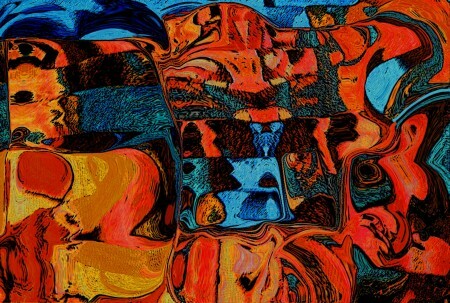 Examples of Ken’s work can be viewed on his page in the ARTS Obispo’s Visual Artist Directory. In my studio…..I’m at home. Literally. I share a small beach cottage with my partner Susan Owen, eight cats and the “obstreperous border collie” as Susan says. I work wherever there is room, which might be anywhere. I’ve been involved in the arts all my life, as an artist, as a music producer for KCBX Public Radio from 1980 to somewhere around 2003. I served as Arts Council President 1n 1985 and ’86. I spent ten years as a board member of the Foundation for the Performing Arts Center, during that time my work was focused on the acoustics of the auditorium. These days I can occasionally be found climbing about inside “Lucretzia,” the C.B. Fisk pipe organ in the main hall, where I perform last minute tuning before organ recitals. The university where I majored in art acquired a computer during my first year. A gigantic thing, taking up most of a floor in the administration building, where data was stored on paper cards with holes punched in them. We students viewed the whole idea with deep suspicion. The idea that a computer could have any part in “THE CREATIVE PROCESS” would have been utterly dismissed, an article of faith and all that. And really, as long as the beasts were the size of small houses, or later filled a large room, and more recently had disk drives the size of manhole covers (I wonder about the origin of the term computer crash), I can understand the sentiment. People who actually used computers were almost as rare as organists, and for the same reasons, both were large, expensive and definitely not portable. As for the notion that computers could never be part of the creative process, currently I’m working in the digital realm, exploring what happens when you deconstruct a digital photograph, scramble the information and reconstruct it in a different way. When my printer is producing a print, I hear it whispering artartartartartart thunk artartartartart………. 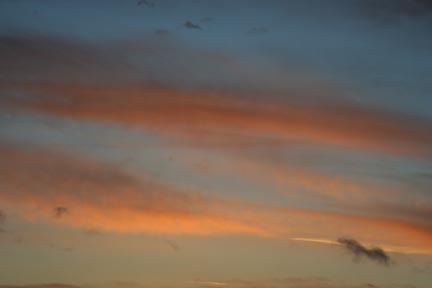 Here are two examples, both derived from the same source, and here is the source photograph. Susan and I invite you to visit us at our art blog: cadogblog.wordpress.com and in person at our studio/home during both weekends of this year’s ARTS Obispo Open Studios Art Tour (see #67, page 17 in the Art Tour catalog). p.s. Copies of Skosh, A Different Dragon will be available, and the cats and dog will not be under foot. In my studio I am surrounded by animals. In many of my paintings, I have chosen animals as my bridge of communication with the viewer. These wondrous creatures speak for me in a way my words never could. The subjects each have their own expression, their own mood, just as humans do. I constantly experiment to create movement, depth, and visual impressions that I hope will leave a lasting impression. I want the viewer to get lost in the worlds I create. To see even more of Larry’s work, visit his website and be sure to stop by his Morro Bay studio both Open Studios Art Tour weekends. In addition to ARTS Obispo’s website, catalogs will be available soon in Morro Bay at Art Center Morro Bay and the Morro Bay Chamber of Commerce. In my studio guests will be greeted to a virtual market place of ART. Artwork in all shapes and size, mediums and forms. Everyone who follows my work knows my versatility. Buyers will see colorful oil, acrylic and watercolors paintings and be delighted with an artful display of ceramic tile, Italian tile and glassware arranged to entice them. 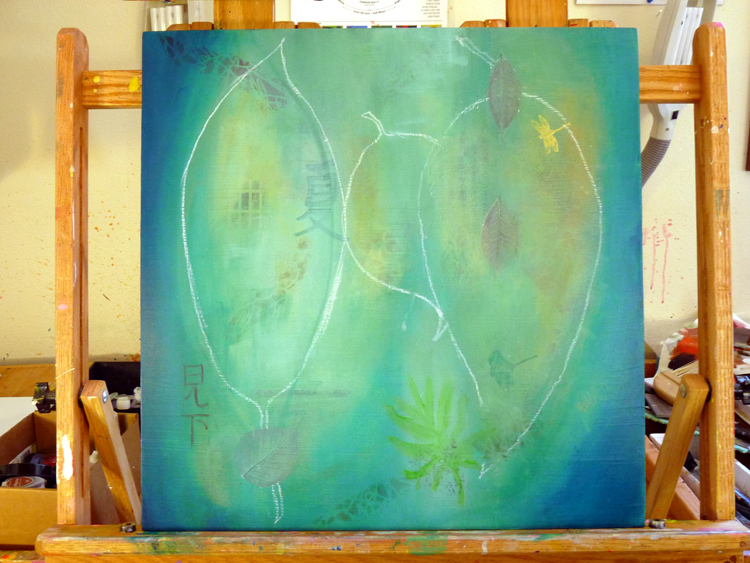 My studio will be ready for guests to see “WHERE ART GROWS”. And by the way, on my 5 acres the view is spectacular, and the drive will be worth your effort. I have a current show at Talley Vineyards, September and October. Please visit. Also visit me on Facebook, Lorri Trogdon Designs. 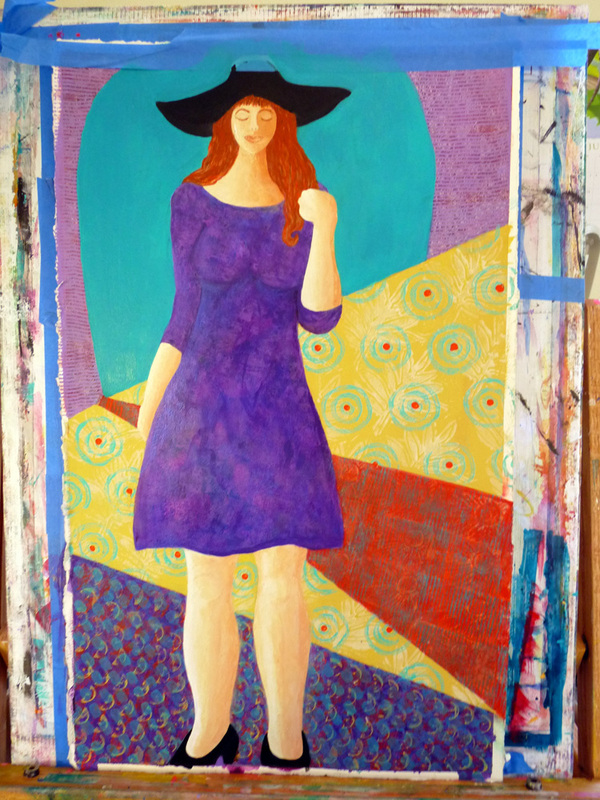 Lorri is #26 in your Open Studios Art Tour Catalog. 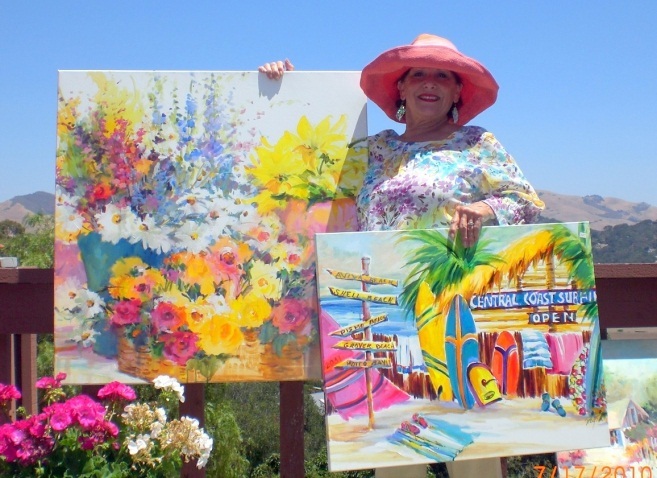 Her studio is located in Arroyo Grande. You can visit her on October 15 & 16 from 10am-5pm. Posted in "In my studio I am..."
In my studio I am joined by the strangest people and animals and such! I am in another world when I’m there by myself-no one else can see them. It’s very exciting- not scarey at all! I just let myself go down this path where there is no need for drugs of any kind (except a little coffee now and then- “they” allow that.) Soon I find myself creating their poses and background. It changes occasionally-I have to be alert and flexible! And then, just like magic..click! It’s there! I blink, shake myself and walk away. Look for Jeanette in Cambria this October! 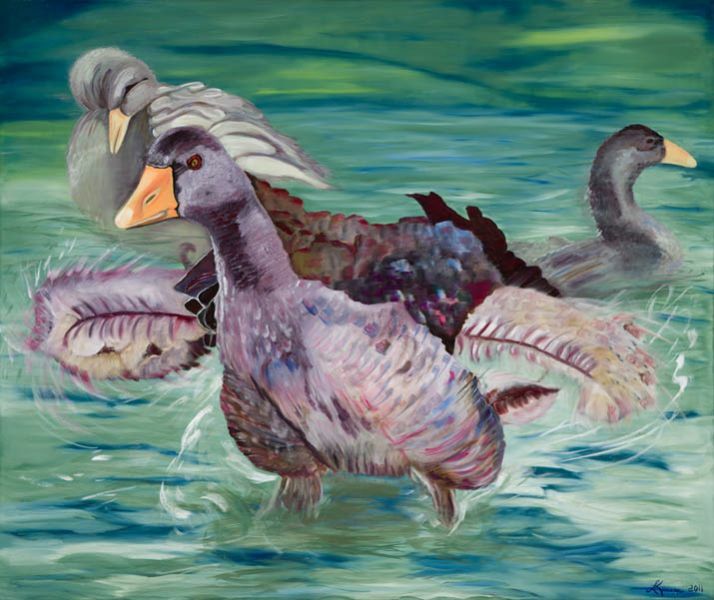 Jeanette Wolff is # 163 in the Open Studios Art Tour Catalog (page 33).